Just few days we back reported that Dungeons of Dredmor has been released for Linux on Desura. However the game has been around for quite some time as Windows build was released earlier than Linux. Now in an interview with DIYGamer, Gasplamp Games has announced that they are working on a expansion which will bring some new goodies. They have also posted some further details on their blog. The expansion will see introduction of female protagonist which has surprised many users. New skills, weapons, monsters, items, crafting recipes etc will also be introduced. Other than all these things, probably the most exciting feature coming soon would be new the mod tools that will allow users to create and tinker game content. In fact these mod tools will be used to implement the expansion which will be released before the end of the year. 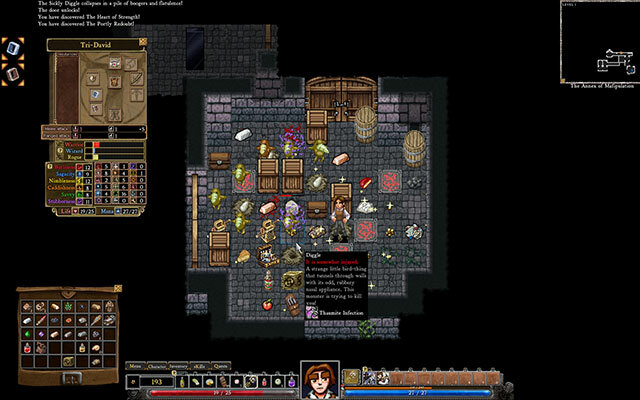 Dungeons of Dredmor has also garnered very good sales for Gaslmap games, though they have not divulged sales figures. However, they do have something to say about the recent launch of Linux build. So Desura allows us to do something really great: we have been promising the Linux community a native build of Dredmor since before it was released and we are glad to be supporting a community with some great people in it. Desura is smaller than Steam, as any analytics will tell you, but it gives us a place to connect to that audience very easily, which is something that we’re really interested in doing. The actual Linux sales situation itself… well, it’s interesting. Because we include our Linux binaries in our Steam install, so that people can extract them with WINE and run a native version of the game, it’s hard to get exact numbers. The distribution situation is so fragmented on Linux, though, that no one sales portal holds all of the cards. Its really heartening to see Indie devs getting their due recognition and money too. All we need now is getting DoD in next Humble Indie Bundle and Ubuntu Software Center.